MANILA, Philippines - Six of the country's best schools were included in the latest QS Asia University Rankings for 2018, with results of the study released on Tuesday, October 17. University of the Philippines (UP) is still the top Philippine institution, ranked 75 or down by 5 points as compared to last year. "UP Diliman is the flagship university of the UP System. It is the administrative seat of the system as well as an autonomous university in its own right," the QS website said. "UP Diliman is not only the home of diverse colleges, offering 94 graduate and undergraduate courses, it also runs several centers of research, many of which have been declared by the Commission on Higher Education as National Centers of Excellence," the website added. The Ateneo de Manila University (ADMU) placed second with its ranking up by 4 spots versus previous year. The De La Salle University (DLSU) is next with its ranking improved from 143 to 134 this year. University of Santo Tomas (UST) got the big lift after improving the ranking from 157 to 145 this year. Once again, the oldest university in Asia and the largest Catholic University obtained four QS Stars, the lone local university to receive the merit. "UST graduates consistently and yearly dominate the top ten in courses with board exams (Medicine, Nursing, Pharmacy, Occupational Therapy, Physical Therapy, Engineering, Architecture, Accountancy, Education, etc.). This proves the University's superior academic programs," the website said. “QS Stars is a rating system which allows students to get a wider picture of an institution’s qualities, looking at everything from the employability of graduates, to sports facilities and community engagement. It is designed to reflect the nuanced mission of universities, and the needs of students who may be interested in things other than those to which traditional rankings are necessarily limited,” QS said. 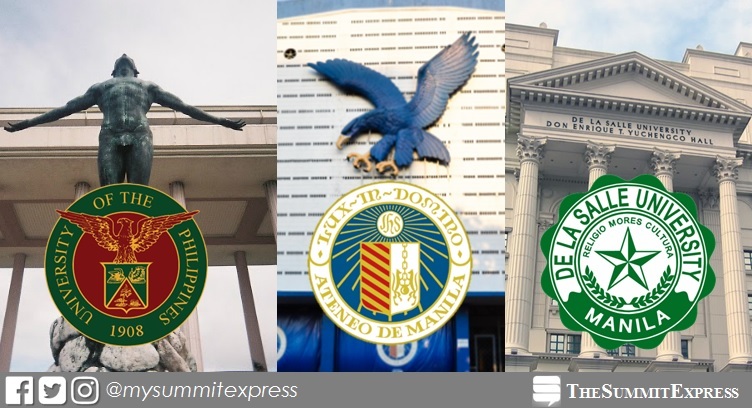 Completing the list are the two universities outside the capital Manila: University of San Carlos (USC) in Cebu and the Dumaguete-based Silliman University (SU). USC and SU ranked 301-350 and 351-400, respectively. The Ateneo de Davao University and Xavier University were unable to enter the list after being 251-300 and 301-350, respectively, in the report last year. Two universities from Singapore lead the way at the top of the 2018 Asia University Rankings, with Nanyang Technological University (NTU) pipping last year’s number one university — National University of Singapore (NUS) — to first place. Published annually since 2009, the QS Asia University Rankings, covering 17 countries this year, highlights the top universities in Asia using these 10 indicators: academic reputation (30%), employer reputation (20%), faculty/student ratio (15%), citations per paper (10%) and papers per faculty (10%), staff with a PhD (5%), proportion of international faculty (2.5%) and proportion of international students (2.5%), proportion of inbound exchange students (2.5%) and proportion of outbound exchange students (2.5%).